Diabetic retina damage. 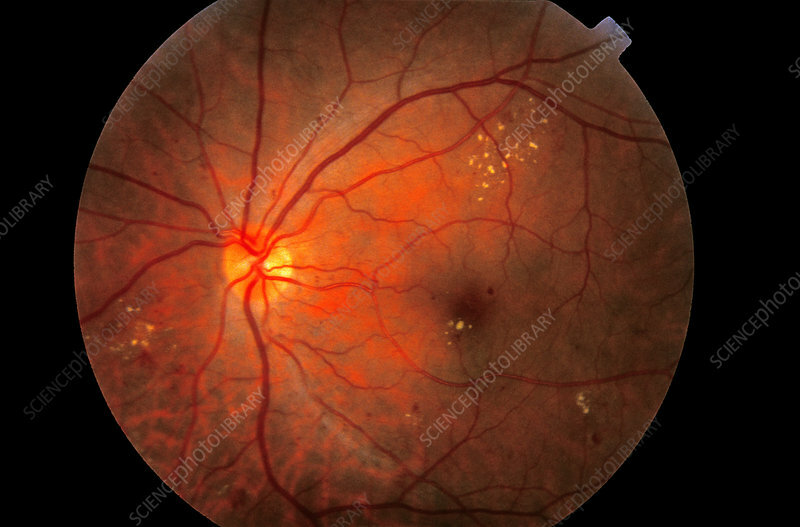 Ophthalmoscope view of the retina of the eye of a diabetic patient with mac- ulopathy, damage to the macula. The macula (dark spot, centre right) is the area of the retina (the light-sensitive membrane) that gives the sharpest image. Numerous yellow patches are seen on and around the macula. These are hard exudates that have leaked from the blood vessels (red) after diabetes rendered them permeable. The patches can cause irreversible loss of vision. Laser treatment can stop leaking from damaged blood vessels, but permanent damage may have already occurred. The optic disc, where the optic nerve and blood vessels enter the eye, is at centre left (yellow).